Today we are the participants of the field day, the publication of Alexander B. Tikhomirov’s photo album. The album is devoted to the fiftieth birthday our countryman. 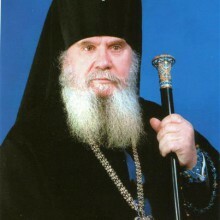 Alexander E. Tikhomirov’s works under the name «Okonopis» are the new current in Orthodox orientation. The photo album of the honoured artist of Russia is a true evidence of the nation’s growing interest to its historical heritage and Orthodox roots. It is also an evidence of nation’s return to its ultural wealth, triumph of faith, enlightenment and culture. Looking at Tikhomirov’s works one might say with certainty that he has managed to satisfy spiritual demands of our nation. This man has shown the well of live water to the world, which is able to revive the seeds of evangelistic sermon, which says : «If any man is thirsty, let him come to Me and drink». Let the photo album of Tikhomirov’s works be clean and pure well of the Word of God, presented in Orthodox «Okonopis». God bless his works and spiritual revival of our nation and cover with success all his future beginnings. Archbishop of Blagoveshchensk and Tinda.